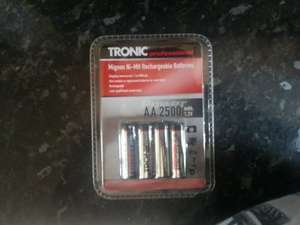 Lidl have the rechargeable batteries in these are really decent batteries for the cash. I bought some last year and think they are well cheap for the quality. I can't quite recommend these. They are fairly unstable so try to trickle charge if you buy. Look for the display stand of 2 packs of 2 Varta (Enloopish) for £4 (£2.99 for 2). I bought both the green and these last year. Far better than the Maplin ones. Will be stocking up for my Solar Lights. Yes the green ones are very good and maybe these have improved. With Varta on sale will the green ones ever reappear? The smart money is on Eneloop, which hold about 85% capacity after 5 years. These may be 2500mAh when they're new, but next year they'll be about … These may be 2500mAh when they're new, but next year they'll be about 7-800. I bought loads for various torches and remotes, and they're only good for a year or two max, then you end up putting them in the battery recycle box (also at Lidl) :pThe smart money is on Eneloop, which hold about 85% capacity after 5 years. 3 year warranty...... not happy, get em replaced! BTW do they still hold 85% after 5 years, or will they charge to 85%? £7.99 for four isn't much. It means they'll still have (charge to) 85% of their rated capacity (so 2000 * 0.85 = 1700mAh after 5 years. Also and to put it another way, you need a battery, you go to the drawer and get an Eneloop out that's been sat there for 2 years, and it will work. Wheras these Tronic ones, they'll be flat (even after 3 months), you stick them in your charger, and it just flashes the "WTF?" combination on the LED's. Also add the fact that electricity cannot disappear into thin air so that 'leak' must mean some serious detoriation happens whilst the Eneloop do sound like they willl last 30 years.